Solar activity is picking up in pace right now, with coronal holes appearing close to where they appeared before the 4 September earthquake in Christchurch. The sunspot number today was 63. It was 54 on the 4 September. One sunspot in particular, called AR1158 is growng rapidly and poses a threat to Earth. Solar activity has been stepping up since 10 January but most activity has missed Earth because most blasts occurred on the far side of the sun. Statistically speaking, a plasma bullet in our direction may be overdue, according to spaceweather.com. Compare this to the coronal hole around the end of December, when Christchurch received a large jolt. It means ths area of the sun that corresponds to NZ is again seeing some activation. The window of 15-25 February should be potent for all types of tidal action, not only kingtides but cyclone development and ground movement. The 18th may be especially prone. The possible earthquake risk areas are N/S faults until after 16 February, then E/W faults until 23rd. The moon will be full on the 18th and in perigee on the 19th. This perigee will be the fifth closest for the year. The 15th will be nodal for the moon. On the 20th the moon crosses the equator heading south. Strong winds and swells may arrive around 22nd to NZ shorelines. These are opinions and not predictions, based on observation of repeating lunar patterns. Full moon+perigee in summer brings a lot of ground heat which aids the development of cyclonic systems, whether gales, tropical lows, tropical depressions or fully named cyclones. The gales bring the destructive winds that dry out the ground in some places to create dust nuisances in Australia, or if combined with rain brings localised flooding. Full moon+perigee has also been labelled "earthquake weather", as it can create increased high pressure on the surface of the land, and this has been suggested to act as a possible trigger separating tectonic plates. For an earthquake to occur many factors have to come together, but sun activity, full moon and perigee are arguably the most potent, and they are all starting to chime now. Over the next 10 days a 7+ earthquake somewhere is very likely. This could also be a time for auroras in the northern hemisphere and in the southern tip of NZ. It may also be a time for whale strandings because of increases in underwater earthquakes. The 7+ is sure to be somewhere in the "Ring of Fire", where 80% of all major earthquakes seem to occur, and NZ is at the lower left of this Ring. The range of risk may be within 500kms of the Alpine Fault. The northern hemisphere are still enjoying winter and full moon+perigee in winter typically brings milder temperatures. A dry period is therefore forecast for much of Ireland and parts of the UK until a few days around the full moon, then clearing again for about a fortnight in some areas. 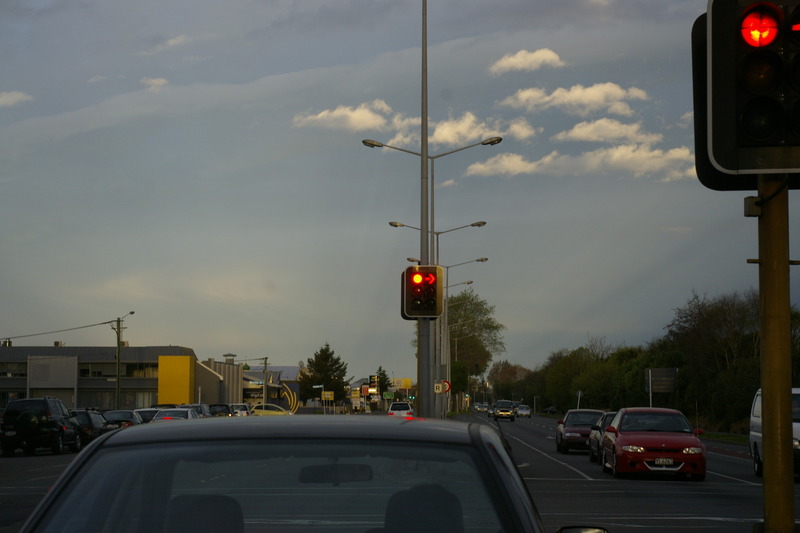 The picture above right shows unusual lighting in the air, and weird cloud formations, the late afternoon before the Christchurch earthquake. It was snapped by someone driving home, who felt something odd enough was happening that was worth getting his camera out. Watch for these evening signs - they may mean an earthquake in the early hours of the next day: birds falling silent, strange flashes, very heavy air, animals very unsettled in their movements and in their voices, pets running away, feelings of dizziness, the barometer on a sudden steep upward rise, a big difference in the predicted tide time and height and the actual occurrences, small cracks appearing in roads, paths and on the sides of buildings. Although the moon will not be as close as it was in the first week of September, at fifth closest for this year it is not to be dismissed. By the 25th the risk should be passed. The risk is no greater than it has always been in NZ; after all they call us The Shaky Isles. But it has taken the Christchurch event of 4 September to make us realise that we are in a very tectonically active part of the world. It has always been like this, which is why all of our tourist features have been formed by earth upheavals, tremors and shifts. The unusually remarkable landscape is also why our country is considered so beautiful. Around the time of the signing of the Treaty of Waitangi only half of Wellington was there. The coast road came out of the sea in 1875 and The Basin Reserve became landlocked. Before that it was the basin harbour and ships sailed right in for repairs to be done. Napier was on the hill, there being little of it down on the flat before the 1931 earthquake changed the coastline. We should expect all areas to be at risk 24/7. It is just the reality of living here. We should also especially stay away from old cracked buildings around new and full moons.